The impressively expansive volume Ruins of Modernity, published in the Politics, History and Culture series of Duke University Press, takes an innovative approach to the modern condition through ruins. The introduction sets out the theoretical, temporal and spatial parameters from which the volume’s twenty-four masterful essays, written by major scholars representing a broad range of fields, view their ultimately diverse subject by interweaving the two complex terms of the volume’s compact title. The ruin as an object for analysis and as a philosophical category of modernity proves to be a contradictory creature, for as the editors and the contributors show, it describes an empty structure left standing and a shell collapsed on itself, it is produced by history and is man-made and it represents the endurance and the breakdown of modern utopian thought; ruins are read in this volume for their historical traces, affective impulses and aesthetic qualities. Co-editors Julia Hell and Andreas Schönle open their introduction with an apt reference to two ruinscapes that they identify as defining our understanding of both the ruin and of modernity today: the destruction of Berlin at the end of the Second World War and the collapse of the Twin Towers in New York on 9/11. The specter of the first ruin haunts the second; the razing of cities under falling bombs shimmers through the crumbling of high-rises at the impact of plummeting planes. Each act of “ruin gazing” by the modern subject necessarily calls upon the “vast visual archive of ruination” produced by the “iconic wreckage of the ages” (1). The ruin, as a “transhistorical iconography of decay and catastrophe,” therefore, reflects the cycle of history as well as its aestheticization (1). Understood in these terms, ruins bring the past into the present and situate the gazer at an affective and emotional position across from the ruin. The historicity, affectivity and aesthetic of the ruin guide the organization of the volume: divided into five sections, contributions examine the “future of the past” in the ruins of modernity, the political implications of ruin rhetoric, empires and imperial dreams encapsulated in ruins, ruinscapes in urban settings and the act of ruin gazing as a process of aestheticization. Each section includes an array of disciplinary perspectives—architecture and art history, literary studies and film studies or archaeology and political science, to name a few pairings—as well as a diverse textual corpus. The questions each author asks of the subject pays testament to the ruin’s theoretical flexibility. Contributions range in focus from the broader questions of authenticity by Andreas Huyssen to the textually bound thoughts on ruins in film by Eric Rentschler, from the historically-bound ruminations on industry ruins in Germany East and West by Kerstin Barndt to the place-specific connotations of the Nevada Test Site by Jonathan Veitch. The reader is asked to follow the ruin as it crosses disciplines, sources, historical frames and geographical spaces, all the while experiencing the ruin’s affective power to inspire nostalgia, melancholia or anxiety. What the opening images of Berlin and New York point to is the manner in which temporalities and historical realities collide in the contemporary ruin, an important theme that is repeated in variations throughout the volume. Todd Samuel Presner proposes a “spatial counterpoint” to Bloch’s “simultaneity of the nonsimultaneous,” what he calls a modernist geography of the “contiguity of the noncontiguous” (203). These apply to the manner in which the volume’s spatial and temporal framings work together to create a theory of modernity through the ruin. The various geographical standpoints and temporal perspectives—from New York to Berlin and India to South Africa, from German colonial Africa to Fordist Detroit to the Third Reich—come together not as comparative realities but as an overlay of noncontiguous spaces and nonsimultaneous historicities that create a contiguous and simultaneous understanding of the place and time of the modern subject. 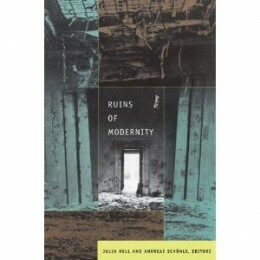 Speaking through their contributors, Hell and Schönle ask whether we might read the ruin to identify the trace of modernity’s past that simultaneously indicates its possible future, but also to discern the trajectory of modern utopian desires and anxieties imprinted on the material object (5). In one of the closing essays, Johannes von Moltke invokes Leopold von Ranke’s statement on the historian’s construction of the past “wie es eigentlich gewesen (how it actually was),” seeing it to stake a “claim to realism grounded in the indexical quality of the historical source, or trace” (399). Reading the ruin as source, then, points to a supposed truth based in historicity. In his opening essay to the volume’s first section, Huyssen probes just such truths by pursuing the connection between authenticity and the ruin, suggesting that each can be considered the central topic of modernity: “Real ruins of different kinds function as screens on which modernity projects its asynchronous temporalities and its fear of and obsession with the passing of time” (19). The ruin represents the “problem of a double exposure to the past and the present,” in that the past, as decay, is imagined to persist today (20). The trace’s claim to historical truth or reality, even as an imaginary, establishes its complex and affective relationship to the ruin gazer as a modern subject. In looking at the image of Berlin projected onto the screen of New York, the ruin gazer experiences anxiety about seeing the present as past. But when this gaze is turned toward the future, it enacts what Hell terms “scopic reinventions” that “represent scenarios of identity—that is, scenarios in which the ruin gazer in the present imagines another ruin gazer like himself looking at the ruins in the future” (176). All societies past and present, the ruin seems to say, will eventually also be found as a trace inscribed onto a future ruin, a thought that soothes the ruin gazer’s mortal anxiety. Ruins, therefore, represent the utopian vision of their collective creators. Whether the ruin takes on a “restorative social function,” as Schönle points out, or represents the “shadow of democratic progress” as Russell Berman claims, the ruin is created through human agency (97, 107). Even those ruins left behind by catastrophic events of nature—the Lisbon earthquake or hurricane Katrina—are the result of human desire; human sin (God’s avenge) is always a political sin (environmental damage). Understood as such, the ruin contains a utopian impulse, for as Amir Eshel points out, ruins allow the ruin gazer to “experience hope” (135). Ruins “haunt us not only because of their past but also because they allow us to project onto them our wishes, desires and hopes for the future: to see them as a space that is still in becoming rather than a site that merely marks what was” (147). The ruin embodies the trace of history while also telling a story of the collective desires of the now. Finally, the images of Berlin and New York invoke the aestheticization of modernity’s utopian desires. Both Rentschler and von Moltke examine the spatial organization of the representation of the ruin as either horizontal (the expanse of ruin’s empty spaces) or vertical (the sky-high piles of collapsed buildings), corresponding well to the Berlin/New York ruinscape, but also to the outward and upward spatial metaphors of modernity (410-11; 418-19). Such a “ruin aesthetic engages the viewer in the space and time of a melancholic mise-en-scène that suspends historicity” (411). This corresponds to the editors’ warning at the outset of the volume that references Arendt’s reading of Benjamin’s angel of history: the “aestheticization of ruins is unavoidable” (1). The angel stares wide-eyed at the ruined wreckage of the past while being propelled toward an uncertain future. The beauty of both the past’s wreckage and the angel’s fear spark feelings of melancholy in the viewer that allow the modern subject to ignore the ruin’s claim to historical authenticity, or rather, to forgo any lessons drawn from the past. If the ruin is “one of the master tropes of modern reflexivity” in that it represents the “reflexivity of a culture that interrogates its own becoming,” then it is perhaps no surprise that Ruins of Modernity itself engages this reflexivity to enact its own becoming (6-7). The volume’s ruminations on ruins can be read also as ruminations on thinking and writing about modernity. Helmut Puff writes of the ruin that as a figure of thought it carries with it its own history: “Layers of usage over time have sedimented into its current configuration” (254). The reader of Ruins of Modernity ultimately engages in an excavation of the ruin, uncovering it from its historical, affective and aesthetic layers of usage, revealing how modernity is an operation always in progress. The excavation is enlightening, rewarding, and—despite the text’s daunting size—thoroughly enjoyable. Carrie Smith-Prei (Ph.D. 2006, Washington University in St. Louis) lectured at the University of Potsdam and the National University of Ireland, Maynooth before moving to the University of Alberta in 2008. She has also been a visiting scholar at the Free University Berlin and Trinity College Dublin. Her articles focus on contemporary German culture, gender, aesthetics and the politics of the private. She co-edited a volume on lesbian representations in twentieth-century German culture and is currently working on a monograph examining the relationship between family politics and narrative aesthetics in 1960s West German literature.